The success of Chimeric Antigen Receptor T-cell therapy (CAR TCTx) in leukemia has been difficult to translate to solid cancers. Antigens shared amongst individuals are scarce. Contemporary technologies enable analysis of lesion specific peptide-class I human leukocyte antigen (pHLA-I) complexes. 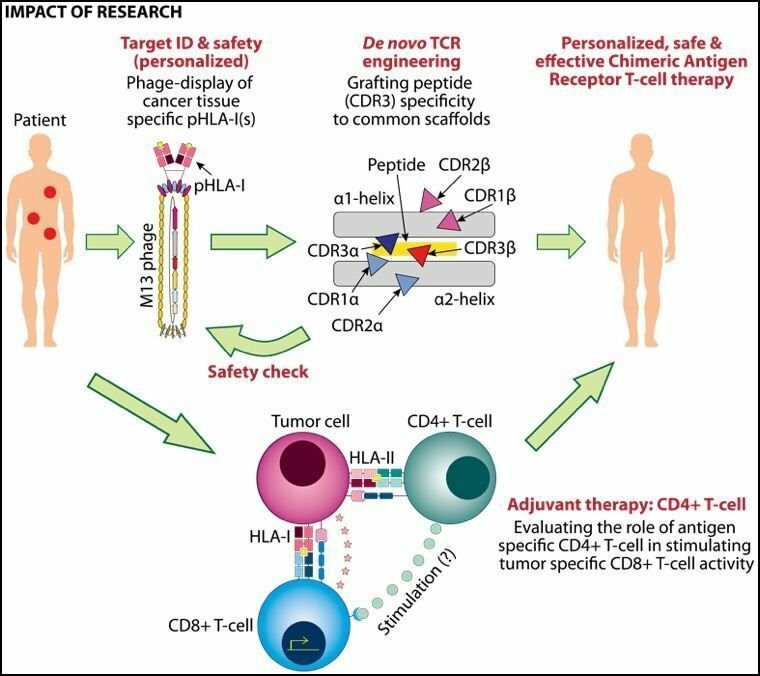 However, lack of robust cost-effective methods to analyze pHLA-I interactions and to discover T-cell receptors (TCRs) within a clinically relevant time-frame have hindered personalized therapy. In Aim 1, using phage display, a robust technique amenable to large-scale library generation, we will develop a method to rapidly study pHLA-I interactions. The mined information will be used to computationally predict cross-reactivities toward different TCRs. Of eight cancer tissue derived pHLA-I complexes, we have confirmed expression of six on bacteriophages. Their folding has also been verified using antibodies that recognize conformational epitopes on pHLA-I complexes. We are currently designing TCRs against them. Complementarity Determining Regions (CDRs) 3 within TCR chains contact the peptide whereas CDRs 1 and 2 confer HLA-I specificity. CDR3 engineering (Aim 2) will enable grafting distinct peptide specificities on common HLA-restricted scaffolds thereby reducing TCR discovery times. Cross-reactivities can be readily verified using technologies described in Aim 1. Phage display of pHLA-II(s) (Aim 3) will allow evaluation of CD4+ T-cells as adjuvant therapies. These three novel technologies will enable the development of immunotherapies that are personalized and highly specific, and yet safe and highly effective.